Branched-chain amino acids (BCAA) is the name given to three of the eight essential amino acids needed to make protein: leucine, isoleucine and valine. They are called branched-chain because their structure has a ‘branch’ off the main trunk of the molecule. The combination of these three essential amino acids makes up approximately one-third of skeletal muscle in the human body. In order to get energy, the body can actually break down muscle to get these BCAAs. Therefore, by supplying them during or after a workout, muscles and other tissues are spared from breakdown, which occurs as a natural part of metabolism. Leucine is the most readily oxidized BCAA and therefore the most effective at causing insulin secretion from the pancreas. It lowers elevated blood sugar levels and aids in growth hormone production. Leucine works in conjunction with the other two BCAAs to protect muscle and act as fuel for the body. They promote the healing of bones, skin and muscle tissue, and are often recommended for patients recovering from surgery. Food sources for leucine are: meat, nuts, beans, brown rice, soy flour and whole wheat. Isoleucine stabilizes and regulates blood sugar and energy levels. It is also needed for hemoglobin formation. When coupled with the other two BCAAs, they enhance energy, increase endurance and aid in the healing and repair of muscle tissue, making them a valuable tool for athletes. After a group of healthy people received a single intravenous infusion of these amino acids, the amount of tissue breakdown that normally occurs overnight decreased by 50 percent. In another study, the muscles of a group of marathoners and cross-country runners were spared completely with a daily dose of them. People suffering from many different mental and physical disorders have been found to have isoleucine deficiency, which can lead to symptoms similar to those of hypoglycemia. Isoleucine can be found in foods such as chicken, eggs, fish, meat, rye, almonds, cashews, chickpeas, lentils, soy protein and most seeds. Valine is the third BCAA. It also aids in muscle metabolism, tissue repair and the maintenance of proper nitrogen balance in the body. It may also be helpful in treating liver and gallbladder disease, and is good for correcting the type of severe amino acid deficiencies which can be caused by drug addiction. However, an excessively high level of valine can lead to symptoms such as a crawling sensation in the skin and possibly cause hallucinations. Sources for valine are: meat, mushrooms, peanuts, dairy products, grains, and soy protein. There is evidence that taking BCAAs orally seems to reduce muscle breakdown during exercise, increase protein synthesis, regulate blood sugar levels and aid in fat loss. Additionally, BCAAs have been studied for their potential role in delaying central nervous system (CNS) fatigue, especially in athletes. Particularly important for all bodybuilders, BCAAs’ anabolic properties are ranked as high as commonly used steroids. And it is not just the healthy physically active people who thrive on BCAAs. Clinically, Branched Chain Amino Acids are used to treat depression, diabetes, anorexia, irritability and headaches that result from protein deficiency. So, can what is so special about the BCAAs? Aren’t all amino acids the same? Not at all. Even though all amino acids are important for the simple fact of their paramount involvement in cellular metabolism, the mechanism by which these work is much more complex. BCAAs are a group of essential amino acids comprised of three essential amino acids. You have to memorize this famous trio as remembering to get these in sufficient amounts may do your body, mind and overall immunity a lot of good. The names of Branched-Chain Amino Acids are leucine, isoleucine and valine. All essential amino acids are needed to maintain a positive nitrogen balance. But when the three essential ones in focus, Leucine, Isoleucine and Valine, are combined together, they are used differently by the body. Branched-Chain Amino Acids act as nitrogen carriers assisting the muscles in synthesizing other amino acids needed for building new cells and tissues. If this sounds pretty much the same as for other amino acids, read this: BCAA have been studied for their unique metabolism and ability to reduce or delay the onset of ‘central fatigue’, also known as fatigue of the Central Nervous System rather than the muscle. As you may already know, before getting energy to your cells and tissues, any fuel needs to be oxidized, or combined with Oxygen. Physiologically, carbohydrates are the easiest ones to go down that road and form a great team with Oxygen giving you the needed spark to move and think. Proteins have some trouble dealing with Oxygen, but they can still manage after going through a long metabolic pathway known as Krebs Cycle. All proteins fist have to be broken down to amino acids in the intestine, absorbed through the tissues into blood, then travel to the liver which converts these to ketones, and only then amino acids may become useful for the body. What is extremely exciting is that Branched Chain Amino Acids, the leucine, valine and isoleucine, can by-pass the liver stop and be used by the body as fuel in tissues other than the liver. Particularly, these are metabolized in the skeletal muscle tissue, so it makes sense that you use these more rapidly when you exercise. More than that, BCAAs are the first amino acids to be oxidised or used for energy, which is not very typical action of amino acids and proteins. Given the conditions, your muscles can oxidise at least with amino acids – alanine, asparagine, aspartate, glutamate, isoleucine, leucine, lysine and valine. But during exercise, the BCAA trio of isoleucine, leucine, and valine, are given the priority of oxidation. Following ingestion, BCAAs are not readily broken down by the liver. BCAAs in the muscle are able to transaminate Pyruvate to form amino acid Alanine, which is then recycled to glucose in the liver via the Cori cycle. If you really want to dig deep down the chemical reactions, I will try to simplify it as much as possible. BCAAs are broken down to their keto-acid analogues by very specific enzymes Branched-Chain Aminotransferase (BCAAT) and Branched-Chain oxo-acid dehydrogenase (BCOAD). Interestingly, the enzyme concentration increases with exercise. If at rest your body has only 5-8% of BCOAD available, during exercise this number goes up to 25%! What does this all mean? That during exercise you use more BCAAs than at rest. Yes, same for all other amino acids. But the BCAAs are used directly by the muscles, and oxidation is one of the things you need to think of if you doubt that proteins are not the best source of energy. BCAAs are not metabolized in the liver like the rest of nutrients, but they instead circulate and compete for absorption into the blood-brain barrier with the amino acids tryptophan, tyrosine, phenylalanine, and methionine for access to the neural amino acid transport system which allows amino acid entry to the brain. Your brain governs how tired or energized, hungry or satisfied, rested or fatigued you feel. Essentially, several neurotransmitters in the brain, such as serotonin, GABA, dopamine, effect your sensations of mood, drive, pain, weariness and fatigue. 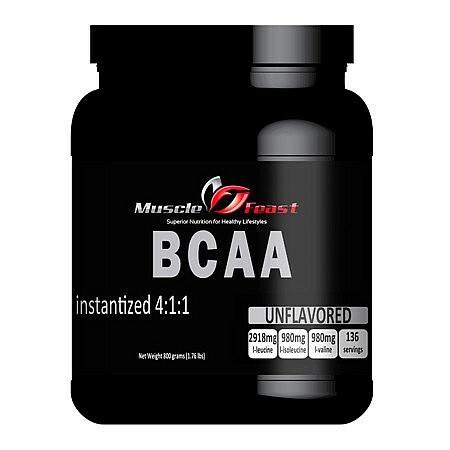 Because the mechanism where the Branched Chain Amino Acids are involved is centered in the brain, BCAAs may help your entire system to go on for longer and delay fatigue. Remember a traffic jam near almost every business or shopping center during peak hours? For some reason, the road is empty at all other times, but when you need it the most, you wish that there were more lanes, right? Same thing with neurotransmitters. When you are at rest, happy and content, sitting on the couch in front of a TV set, all your neurotransmitters are in balance. But when the stress comes, the road by which these travel in your brain gets crowded. Neurotransmitters are derived from amino acids. For example, amino acid tryptophan is a precursor to serotonin (5-hydroxytryptamine, or 5-HT), is known to depress the Central Nervous System and produce symptoms of fatigue. Research has shown that exercise reduces plasma BCAA levels while increasing the levels of tryptophan. This translates into a higher ratio of free tryptophan/BCAA. What does this all mean? Fatigue. More tryptophan means more serotonin. And when serotonin levels are up, you are down. But BCAAs may help turn the tables on fatigue and change the picture. Raising levels of BCAAs lowers the tryptophan/BCAA ratio bringing serotonin down and you don’t even think about getting tired. Some researchers speculate that supplementing with BCAAs will lower this ratio and result in improved mental and physical performance. BCAAs also help maintain and repair muscles and tendons after exercise, injury, chronic illness, and even surgery because in combination, leucine, isoleucine and valine are involved in production of collagen and maintenance of connective tissue. They have shown to stimulate production of insulin, the main function of which is to allow circulating blood sugar to be taken up by the muscle cells and used as a source of energy. In other words, the insulin production induced by BCAAs helps muscle cells to take up other amino acids and use these for constructive purposes. BCAAs are also currently used clinically to aid in the recovery of burn victims, and because the metabolic breakdown is accelerated when an individual is afflicted with a wasting disease such as cancer, AIDS, or end-stage kidney failure, BCAA along with glutamine and medium-chain triglycerides are often used by progressive surgeons as intravenous support for their critically ill patients. The proper dosage depends on a variety of factors – body weight, activity level, lifestyle stress, overall health, and diet. There are no established daily recommendations for this supplement. As a dietary supplement take 25 – 65 milligrams per pound of bodyweight per day. It is recommended that supplemental valine be used in union with both isoleucine and leucine. Mix into water or your favorite beverage 1-2 times daily or as directed by your physician. Mix for 20-30 seconds using a shaker cup or mix thoroughly with a spoon. May not mix very easily. May be hygroscopic and may clump during shipment. This does not affect the efficacy of the product; just the texture. Try mixing in sport drink or anything with a ph less than water to improve mixability. It may be necessary to let it sit for awhile.